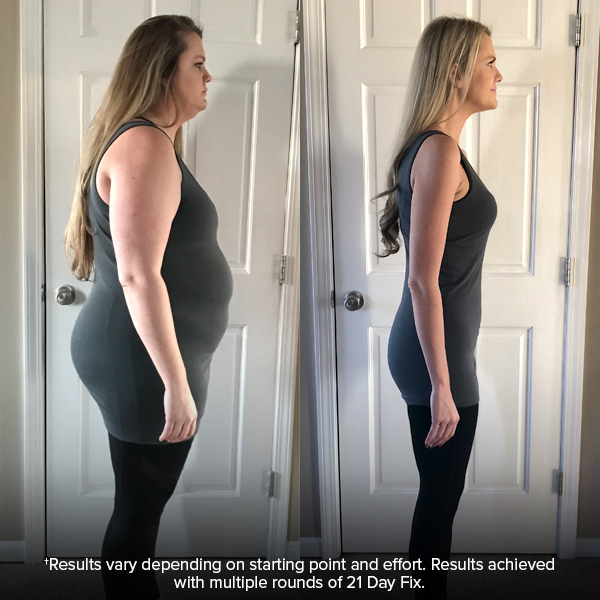 Hannah’s incredible transformation came about courtesy of 21 Day Fix, Shakeology, and months of hard work, dedication, and commitment. This mother of two got motivated to begin working out after struggling with health issues which caused her to gain 115 pounds. She went from 237 pounds to 120 pounds, but even better: Hannah shed her insecurities and negative feelings about her body. Find out how she changed her life for the better by getting fit, healthy, and strong. Before starting Beachbody, I completely lost who I was. I felt like a shell of who I was before gaining weight. I would look in the mirror or see pictures of myself and not recognize who I was seeing. I felt lost! I didn’t want to go to places where people would see me. I was depressed about my weight and I felt so insecure. I was heartbroken emotionally that I could do certain things with my kids; that I couldn’t be the best mom and wife my family deserved. 21 Day Fix was amazing! I did multiple rounds — it was simple to follow and broke down what I needed to do to succeed. The portion-control containers were exactly what I needed to help me understand portions and what kind of foods I should be eating. The workouts were great to do at home and only being 30 minutes I didn’t feel like it was a chore to do them. I actually looked forward to working out. I like the convenience of Beachbody On Demand. When I decided in 2018 that I wanted to lose all the weight, the thought of going to the gym at 237 pounds mortified me. So the fact I could do workouts in my home made me actually want to workout. It’s easy to select my workout every day and get going. I like that all the workout programs are all in one place and I don’t have to mess with DVDs. I loved drinking Shakeology. It helped my sugar cravings and once I got past the cravings, I no longer wanted cookies, cake, and chocolate. I lost 117 pounds doing 21 Day Fix. My body is now lean, healthy, and I’m STRONG! I love the way my body looks and the way I feel. I’m so confident in who I am now, from the inside out! My life has changed drastically — now I love to go shopping and doing things with my family. I use to hide behind my kids and husband for pictures, now I take pictures standing right next to them. I go out and do things with my kids — I have the energy to play with them! I couldn’t go sledding with my kids because it was too hard getting up the hills but now I can climb right up with them. I now look in the mirror and at pictures and see ME! It’s been an amazing and emotional journey. Even though I’m the one that did 21 Day Fix, Beachbody has helped my whole family. My husband and even my 7-year-old daughter did workouts with me — and my husband even lost 34 pounds! My husband and kids were eating unhealthy before I started, and then I started making healthy breakfast, lunches, and dinners not just for myself, but also for my family. My kids started requesting healthy snacks for after school. This program completely changed my whole family’s health and lives.